A hard-working pottery painter is in the process of decorating a small vase. The furrowed brow and narrowed eyes indicates the effort and rigour with which she works. Behind her stands an amphora vase that has already been decorated. Vilhelm Bissen’s encounter with French naturalism in Paris had a great influence on his sculpting. This influence is made clear in this statue, which is one of a series of standing female figures he completed upon his return to Copenhagen. The life-like face and equally life-like shape of her body indicates how Bissen began to use direct naturalistic observation as a regular part of his later mode of expression. 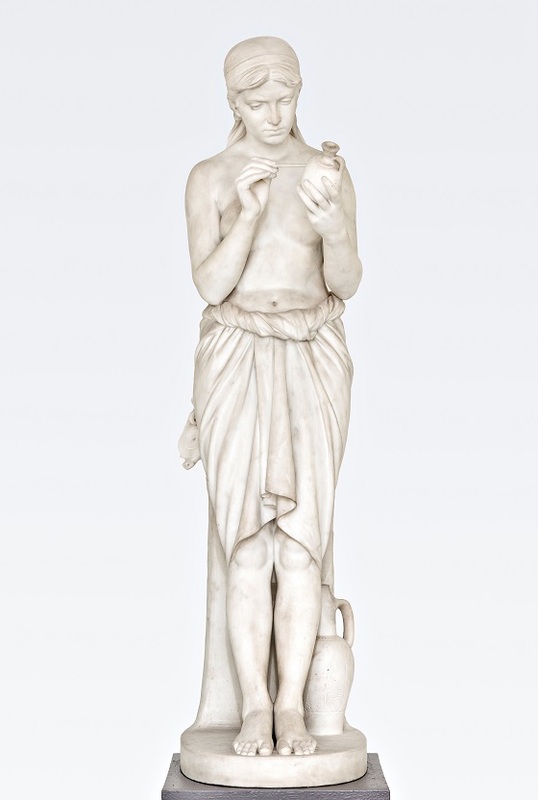 The simple and harmonic line gradients which make up the composition shows, however, that the sculpture’s naturalistic appearance is still rooted in a Classicist approach to form. As a sculptor, Vilhelm Bissen primarily received training in the studio of his father, H.W. Bissen, and was brought up in the tradition of Thorvaldsen. As with Cranach and Breughel in the 15th and 16th centuries, the craft, subjects and clientele was passed down from father to son. Although Bissen would be inspired by French naturalism and its trends near the end of the 1800s, he essentially remained true to his classicist roots. Bissen visited Italy as a young man from 1857-63, and he had several lengthy stays in Rome. The quarries of Carrara were important for Bissen, but so too were his personal relationships with other artists he had come to know in Rome.